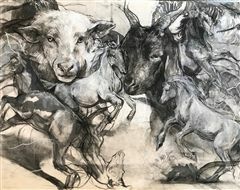 Emma Willard School is proud to have ten visual artists included in the 20th Annual High School Regional Juried Exhibition at the Albany Center Gallery in Albany, New York! Nine Emma Willard School student stock traders competed in the Junior Achievement Stock Market Challenge on Wednesday, April 17. On Monday, April 15, Kirsten Gerald ’81 and Alissa Russin ’08 hosted a Boston Marathon Watch Party to cheer on the Boston Marathon Runners. Last Wednesday, April 17 our students attended our fourth and final event of the Speaker Series for the school year. Emma Willard School hosted Sarah McBride, an author, activist, and the National Press Secretary for the Human Rights Campaign. 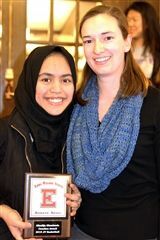 Emma Willard School senior Anna B. has won first place in the Albany-Tula Alliance's 2019 Student Essay Contest! 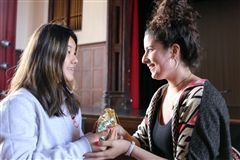 Each year Emma Willard School’s academic departments honor outstanding students with Kudos during Morning Reports. Our Spanish, Chinese, and Latin instructors awarded the first Kudos of the year on Tuesday, April 16. 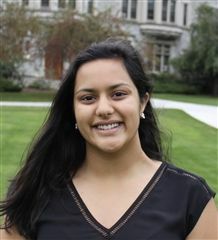 Sabrina L. ’20 has been honored by the National Council for Women in Technology (NCWIT) with a 2019 Aspirations in Computing Award! The Speaker Series, PRIDE, and the Library hosted Drag Queen Story Hour (DQSH) last Thursday, February 28. 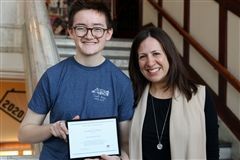 Emma Willard School is proud to announce senior Issac H. has earned the status of National Merit Finalist by the National Merit® Scholarship Program. Head of School Jenny Rao made the announcement at Morning Reports on Friday, March 1. Emma Willard School’s independent programs enable girls to pursue projects they feel strongly about. 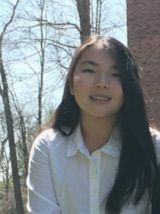 Senior Aira A. saw her family’s struggle with balancing screen time in their lives and was inspired to research the topic further, ultimately launching the company Bye Bye Screen and publishing “7 Step Digital Cleanse for Families,” now available on Amazon. Communications spoke with Aira to learn more about her project and milestones she has reached. Read the full Q&A below! Our athletics department celebrated our basketball, indoor track and field, and ski racing teams at our winter sports desserts ceremony. This season, 12 students earned their varsity letter and pin for the first time; 24 earned a bar pin, signifying their second or more time playing at the varsity level, and 15 earned a pin marking their first time playing at the varsity level in one sport after getting their varsity letter in another. Coaches also handed out Most Improved and Coaches Awards for each team. Last Thursday, February 14, Mr. Ball’s AP Economics class and Jenny Rao, head of school, visited MVP Health Care in Schenectady, New York. The Cluett House program, which focuses on the practices of positive world change, hosts inspiring guest speakers during their weekly seminar series. 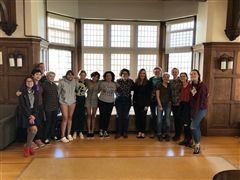 Recently, Cluett House students were joined by a wonderful guest speaker who is very familiar with the Emma Willard School community: alumna Arica Crootof '03, who joined the group via video conference from her home state of Montana. 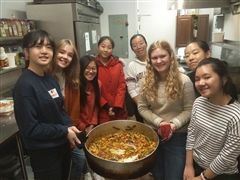 There are many different ways Emma Willard School students can engage with the local community through the school's newly-developing Service Learning and Community Engagement program. The Emma Willard School Arts department shares news of student recognition in national and local arts competitions! 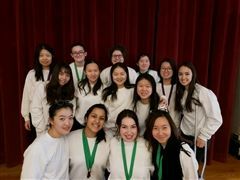 Emma Willard School’s Science Olympiad team had a strong showing at this year’s Regional Competition which took place on February 3 at the College of Saint Rose in Albany, NY. Public Reception Held for "Painting Inspiration: FOR CHILDREN TO THRIVE NOT JUST SURVIVE"
Emma Willard School senior Hyeyon “Stella” Rim held a public reception for her exhibition “Painting Inspiration: FOR CHILDREN TO THRIVE NOT JUST SURVIVE” at the Arts Center of the Capital Region on Friday, January 25. 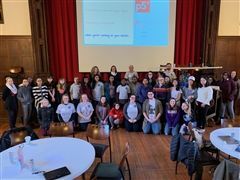 Emma Willard School participated in Processing Community Day Worldwide, hosting Processing Community Day at Emma Willard (PCD@EW) on Saturday, January 19. Each year the Leukemia and Lymphoma Society (LLS) hosts “Students of the Year,” a philanthropic leadership development program for exemplary high school students, that teaches them professional skills including entrepreneurship, marketing, and project management as they promote and fundraise for the organization. 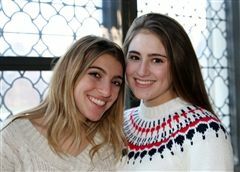 This year, Emma juniors Mimi L. and Ava T. have been selected as the 2019 Students of the Year candidates for the Albany area, and the first ever to represent Emma Willard School. 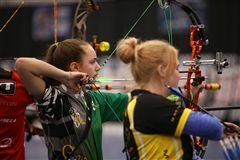 Their aim is to raise $50,000 for the LLS to establish an Emma Willard research grant. 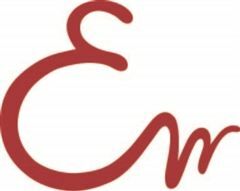 Emma Communications spoke with them about their project and why it is so meaningful to them. In honor of Martin Luther King Jr. Day, Emma Willard School held a two-part program to inspire students to reflect on their place in the world as they strive to become more conscious citizens. 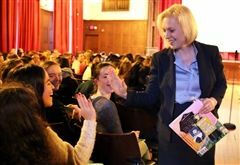 Emma Willard School is proud of alumna Senator Kirsten Gillibrand ’84 as she takes bold steps to continue to serve and lead our country by running in the 2020 Presidential election. 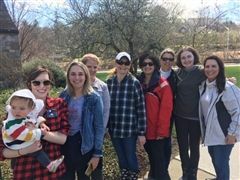 Join Alumnae Relations and current Emma Willard School students in preparation for the Women’s Empowerment March at the Pre-March Poster Party on January 18, 2019 from 5:30 – 6:30 p.m. on campus. 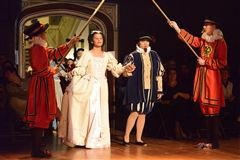 The Great Folk came and brought delight to the Emma Willard School community with their performance of the 104th Revels! 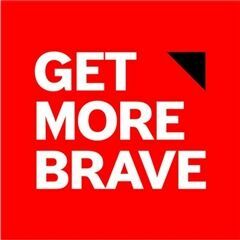 Emma Willard School faculty and staff participated in a professional development workshop hosted by Brave Enterprises on Monday, January 7.